Officers who attain certified proficiency will be paid a language allowance. The Nigerian Army has implemented a new language policy that demands all soldiers to be proficient in the country's three major ethnic languages before 2019, although the English language remains its official language. According to a statement signed by Army spokesperson, Brigadier General Sani Usman, on Wednesday, November 22, 2017, the new policy is part of measures to foster better relationships between soldiers and with civilians. Officers who attain certified proficiency in Hausa, Igbo and Yoruba will be paid a language allowance and will gain an added advantage when applying for recruitment or commissioning into the Nigerian Army. 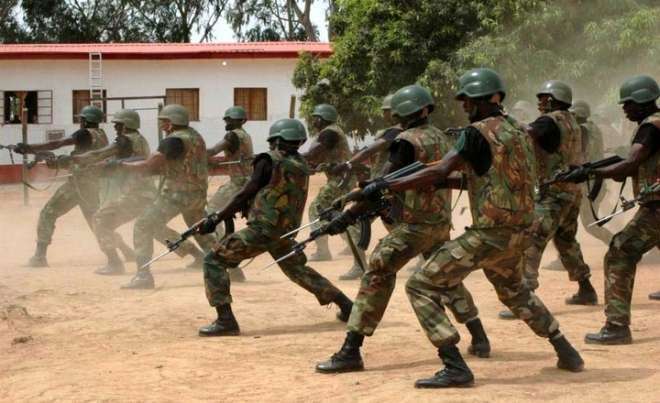 The statement read, "The Nigerian Army has introduced a new Language Policy. The study of foreign and local languages is worldwide practice among armies, in which officers and soldiers are encouraged to be multi-lingual. "The Policy will foster esprit-de-corps and better communication with the populace to enhance information gathering, civil-military relations, increase understanding between militaries when operating abroad and assist officers and soldiers to perform their duties professionally. "It is to be noted that English remains the official language in the Nigerian Army. Yoruba, Igbo and Hausa languages could be used during Civil Military Cooperation activities or interrogation. "Therefore all Nigerian Army personnel have been given one year to learn the three major Nigerian languages. Invariably, by December 2018, all Nigerian Army personnel are expected to learn the three major Nigerian languages. "The standard of proficiency to be attained is the basic level. Certificated proficiency level will attract Language Allowance. "Before now, the Nigerian Army officially encouraged the learning of French, Arabic, Spanish, Portuguese and Swahili. French language is an assessed subject in some career courses and examinations for Nigerian Army personnel." The new policy could be part of a raft of changes agreed upon when President Muhammadu Buhari reconvened and inaugurated the Armed Forces Council on Thursday, November 9. During his meeting with the council, the president ratified the National Defence Policy 2017 (Revised); Harmonised Terms and Conditions of Service Officers 2017, and also inaugurated the Harmonised Terms and Condition of Service for Soldiers/Rating/Airmen (Revised), among others.